A record 1,248 animals were exhibited at the 2015 South Dakota Summer Spotlight, an annual event for South Dakota hosted by the South Dakota Beef Breeds Council (SDBBC). "The SDBBC originally started the South Dakota Summer Spotlight show back in the early '90's," said VeaBea Thomas, SDBBC vice president. "When multiple species became involved, the South Dakota State Extension took the reins. With the changes in Extension in 2012, SDBBC had the opportunity to again run the Spotlight. We still work with Extension to provide educational opportunities during Spotlight. 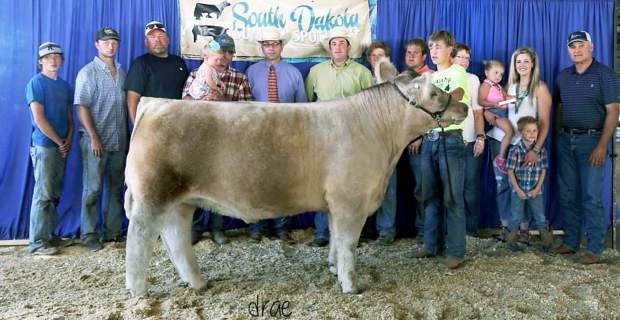 The SDBBC missions include promoting agricultural education and assisting with the running of state livestock shows." Results of the Beef Heifer Show include: Grand Champion Heifer, a Charolais cow/calf pair shown by Cagney Effling; Reserve Champion Heifer, an Angus heifer shown by Tyler Bush; Third Overall Heifer, Simmental Solution exhibited by Chesney Effling; Fourth Overall Heifer, Hereford shown by Kenidy Effling; and Fifth Overall Heifer, Reserve Simmental Solution shown by Cagney Effling. Corey Eggelston won the Grand Champion Market Animal with a Charolais steer; followed by Talli Heim with a crossbred steer for reserve. Trevor Bergh exhibited the reserve champion crossbred steer to win third overall market animal; Brianna Duerre's Chianina took fourth place overall honors; and Talli Heim's Simmental earned fifth place overall, respectively. In the Swine Show, Cash Voegle took top honors, winning the Grand Champion Market Barrow, followed by John Eilertson with reserve. Cash Lehrman exhibited the Grand Champion Market Gilt, followed by Jessica Hauger with reserve. Brin Begalka showed the Grand Champion Prospect Barrow, followed by Cash Lehman with reserve. Cash Voegele won the Grand Champion Prospect Gilt award, followed by Jovie Wirt with reserve. Results of the Goat Show include: Kahli Gall exhibiting the Grand Champion Breeding Doe, followed by Hannah Peterson with reserve. Nalen Dunsmore earned Grand Champion Market Goat honors, followed by Tessa Erdmann with reserve. In the Sheep Show, Madison Rule earned Grand Champion Market Lamb honors, followed by Brinn Begalka with reserve. In the Breeding Sheep division, Camden Miller earned the Supreme Ram, and Danielle Houghtaling won Supreme Ewe. In addition to livestock shows, South Dakota Extension hosted a judging clinic and Artificial Insemination Educational Clinic, as well as the the South Dakota Beef Ambassador Contest, sponsored by the South Dakota CattleWomen. Kaley Nolz won the 2015 South Dakota Beef Ambassador Contest, and Brianna Buseman will serve as the state's Beef Ambassador in 2016. Bridger Gordon won the junior division, and it was a tie in the beginner division for Bennet Gordon and Ella Stievfater. To help raise funds for the South Dakota Summer Spotlight, the SDBBC will host a silent auction on Sunday, Sept. 6 at the South Dakota State Fair. "The silent auction will be held in conjunction with the cattle social at the open class beef barn to raise funds for the 2016 South Dakota Summer Spotlight," said Tammy Mikkelson, SDBBC Executive Director. "If you are interested in donating, contact Veabea Thomas, Tammy Mikkelson or Jeana Hurlbut.